One kid at last night's Blue Jays-Rangers game got the best of both worlds: An MLB foul ball and the attention of a girl sitting in the row behind him. The video provides a few replays to help you follow along, but when the boy catches the actual foul ball, he's already holding a different ball. (The origins of this ball are unknown.) He moves his hand to make it look like he's taking the foul ball out of his glove—at least, to the people around him—then hands his Wendy Peffercorn the other ball. People around him are impressed with his generosity. Suave. 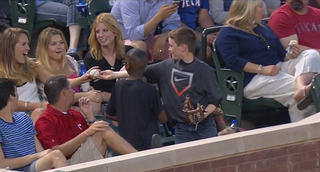 Update: WFAA found the foul ball kid. His name's Austin Chaney, and he explained where the other ball came from. [Chaney] said he went to Saturday night's Rangers game with a teammate's family, sitting in a prime spot near the field. "We were getting a few foul balls, but mainly it was foul balls the third base coach caught and tossed them up," he said. So Austin and his buddy had a stash of them already. "I was told if I got another ball, I should give it to someone else, so I turned around... I thought I was going to give it to someone deep down there, and I saw her right in front of me and I gave it to her," he explained.